Outright gifts include monetary gifts, automatic recurring gifts, memorial or tribute gifts, matching gifts, gifts of appreciated securities, mutual fund shares, tangible personal property, and real estate. A monetary gift is the most popular type of charitable gift. Monetary gifts are fully deductible, up to 50% of your adjusted gross income in the year of the gift. You may take unused deductions over the next five years. Many companies offer matching gift programs to encourage employees to contribute to charitable organizations. Most of these programs match contributions dollar for dollar, and some will even double or triple the amount of your gift. If you wish to make a gift to SRF, please check with your company to see if it offers a matching gift program that will match your gift to make the most of your donation. If your company offers a matching gift program, you can request a matching gift form from your employer, and send the completed form with your gift to SRF by fax to 323-276-5612 or by mail to 3880 San Rafael Avenue, Los Angeles, CA 90065. We will then contact your employer's matching gift program and handle the rest of the details. Your gift of long-term (you must have held the securities for more than one year) appreciated securities to SRF provides you with an income tax deduction for the full market value of the donated stock or bond, up to 30 percent of your adjusted gross income; at the same time, it allows you to bypass the capital gains tax on any unrealized appreciation on the security. You may take unused deductions over the next five years. Mutual fund shares that have appreciated in value make an excellent charitable gift with tax advantages similar to gifts of appreciated stocks and bonds. 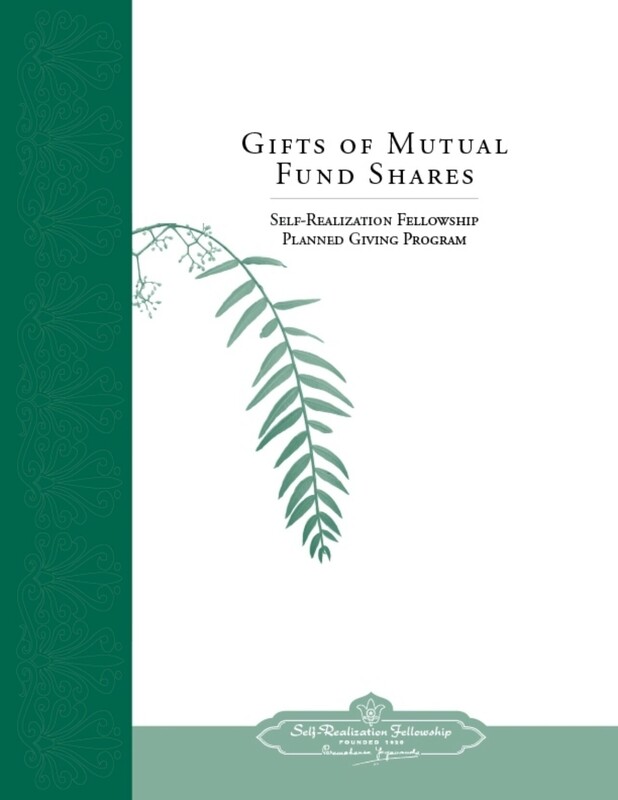 Generally, your mutual fund company must transfer the shares you wish to donate to a new account in SRF's name before they can be distributed to us, and the process for completing the gift can take up to six weeks. Gifts of tangible personal property may be used by SRF to further our founder's work, or sold so that SRF is able to realize proceeds through their sales to help us meet the many responsibilities of the organization. You may wish to make a gift to SRF of works of art, jewelry, gemstones, automobiles, rare books, stamps, coins, musical instruments, or other valuable collectibles. 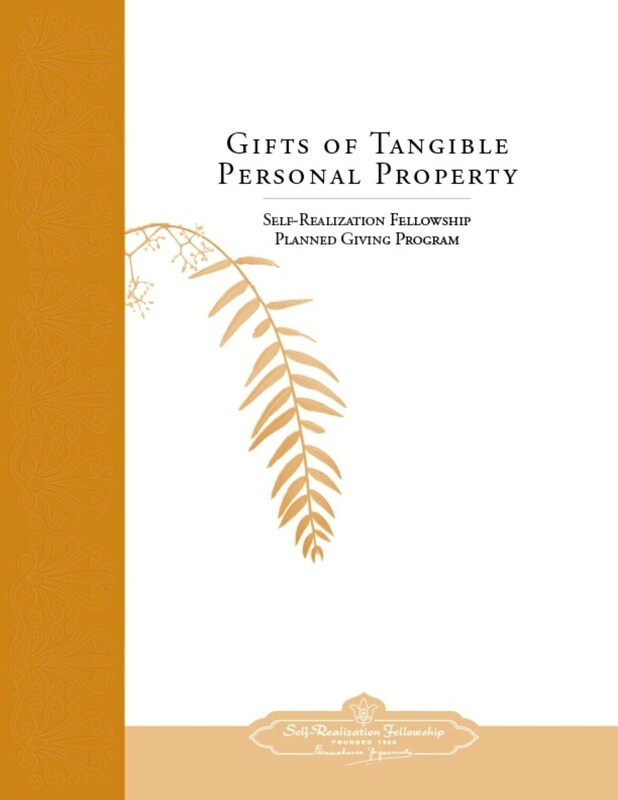 Gifts of intangible personal property, including copyrights, patents, and mineral rights, also make valuable gifts to SRF. Special rules apply to tax deductions for gifts of tangible personal property, which are detailed in our brochure on Gifts of Tangible Personal Property. You may be considering giving real estate as a way of making a substantial gift to SRF. Almost any type of marketable real property can be used to make a charitable gift. 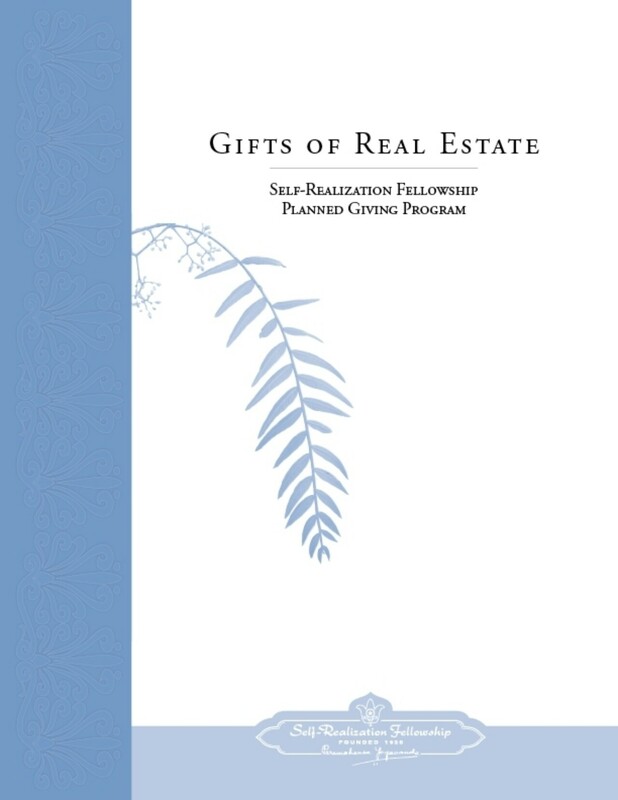 (Donation of real estate is subject to acceptance by Self-Realization Fellowship.) The specific types of property that can be donated include primary residences, vacation or second homes, condominiums, undeveloped land, rental property, apartment buildings, commercial buildings, farms, ranches, forest land, and mineral rights. The property should, however, be unencumbered — as mortgaged property can pose practical problems for SRF and might result in adverse tax consequences for the donor. With an outright donation of real property to SRF, you are entitled to a charitable deduction based upon the fair market value of the property as determined by an independent appraiser. A Gift With Retained Life Estate by deeding your home, vacation home, or farm to SRF, and retaining the right to use the property for your lifetime (and your spouse's). A Life Income Gift by placing appreciated real estate into a charitable remainder trust. The property is sold inside the trust, with proceeds reinvested to generate income for distribution to you during the term of the trust, with the remaining assets to go to SRF at the end of the trust term. A Bequest by making a testamentary gift to SRF of your property in your will or revocable trust. Planned giving is about "tax-wise" philanthropy. The goal of the planned gifts discussed below is to enable you to minimize the cost of giving, while maximizing the benefits for yourself, your family, and Self-Realization Fellowship. Planned gifts include traditional gifts such as bequests, as well as those you might not normally consider, such as gifts of life insurance, real property, and retirement plan assets. A bequest to SRF made in a will or a living trust allows you to make a substantial contribution without diminishing the assets available to you during your lifetime. Most gifts by will or living trust are either specific, general, or residuary bequests. A specific gift is a donation of a particular piece of real property, stock, or other clearly identified asset(s). A general bequest usually takes the form of a specific dollar amount given to SRF. A residuary bequest generally involves a specific portion or percentage of the entire estate that is paid to the residuary beneficiary after all specific bequests have been satisfied. A bequest is deductible for federal estate tax purposes, and there is no limit on the amount of the estate tax charitable deduction. In addition, bequests generally are not subject to state inheritance taxes. You can make a bequest to SRF by creating a new will, adding a codicil (appendix) to your present will, or including SRF in your revocable trust. Charitable remainder trusts (CRTs) are gift arrangements that enable you to receive an income from the trust for yourself and/or another beneficiary for life or a term of years; at the end of the trust term, a CRT that names SRF as the remainder beneficiary will distribute the assets of the trust to SRF CRTs are irrevocable trusts, and they can be funded with cash, real estate, publicly traded stocks and bonds, or other types of assets. There are two types of CRTs: charitable remainder annuity trusts and charitable remainder unitrusts. A charitable remainder annuity trust offers the income beneficiaries a fixed annual income stated as a flat dollar amount or as a percentage of the value of the initial trust assets. A charitable unitrust provides a variable annual payment, based on a percentage of the trust assets (not less than 5%) as revalued annually. A charitable lead trust (CLT) that names SRF as the income beneficiary will provide SRF with an annual income during the term of the trust. At the end of the trust term, the assets of the trust pass to the beneficiaries named in the trust. You can fund a CLT with publicly traded securities, income-producing real estate, partnership interests, or a combination of the above. You can donate a life insurance policy to SRF or simply name SRF as the beneficiary to receive the insurance proceeds. For a gift of a paid-up policy, you will receive an income tax deduction equal to the lesser of the cash value of the policy or the total premiums paid. To qualify for the federal charitable contribution deduction on a gift of an existing policy, you must name SRF as owner and beneficiary. Using your retirement plan as a gift vehicle can be a tax-efficient way to fund part or all of your bequest to SRF because your interest in retirement plans that remain in your estate are often subject to both estate and income taxes when received by your heirs. In the case of a large estate, the effective combined tax rate on a retirement plan may exceed 70 percent. You can name SRF as the beneficiary or contingent beneficiary of your IRA, Keogh, 401(k), tax-deferred annuity, or other qualified plan. Because SRF is tax-exempt, beneficial ownership of the plan passes from you to SRF upon your demise without any income tax or estate tax. You can donate your home, vacation home, or farm to SRF while retaining the right to live in it for the rest of your life (and your spouse's life) or for a term of years. Your donation will qualify for a federal income tax deduction, up to 30 percent of your adjusted gross income. You may take unused deductions over the next five years. While you retain the right to live on your property, you continue to be responsible for all routine expenses, including maintenance fees, insurance, property taxes, repairs, etc. If you later decide to vacate your property, you may rent the property to someone else, or sell the property in cooperation with SRF.